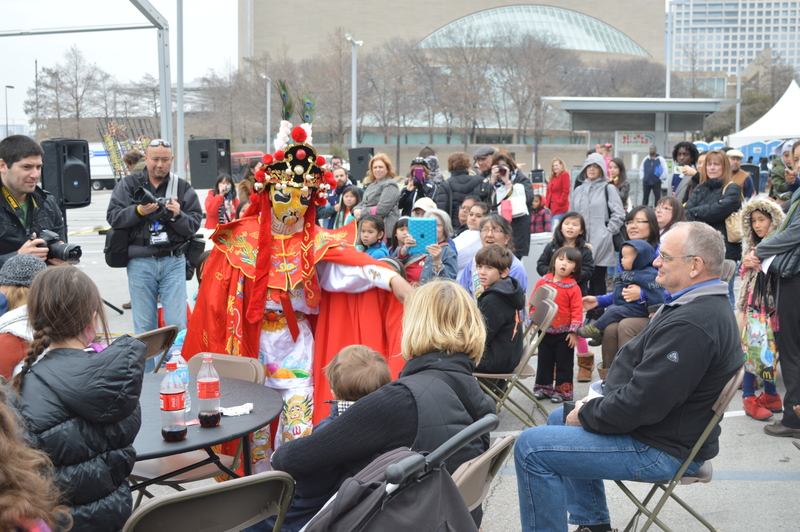 Over 10,000 Dallas residents said goodbye to the Year of the Snake and hello to the Year of the Horse at the Crow Collection’s fifteenth annual Chinese New Year Festival on Saturday. Stacie Adams, who has served as the Director of External Affairs for the Crow Collection of Asian Art museum for the past two years, says that the festival keeps on growing each year. “The interest and the engagement in the Asian community keeps growing,” Adams said. She said two years ago, a total of 8,500 people attended the day’s events and last year, 10,000 people attended. While the final count for the 2014 celebration has not yet been counted, Adams expects the number to exceed 10,000 people. Festivities began as early as 10 a.m. and lasted until after 6 p.m. in front of and around the Crow Collection of Asian Art museum on Flora Street in the Dallas Arts District. The morning kicked off with the Four-Lion Dance, a traditional dance meant to bring good luck and fortune for the New Year. There were several new additions to this year’s horse-themed extravaganza, including an elevated main stage that featured must-see groups and acts performing every half hour. Throughout the afternoon, there were performances by the Dallas Asian American Youth Orchestra, Jiaping Shi Dance School, Jasmines Chinese Dance Troupe, Betty Soo, Orizon, and JK Wong Academy to name a few. The evening concluded with fireworks by Star S Productions SFX syncopated with music by Tan Dun. Lining the streets were various booths of community partners where each vendor presented a different art activity for kids. With face paint, live horses, fortune telling and food trucks galore, this was truly an event for all ages. Visit the Crow Collection of Asian Art Museum at 2010 Flora Street in Downtown Dallas where admission is free every day.